QR C ODES AND I - NIGMA By Margie Mutimer St Thomas The Apostle Blackburn. 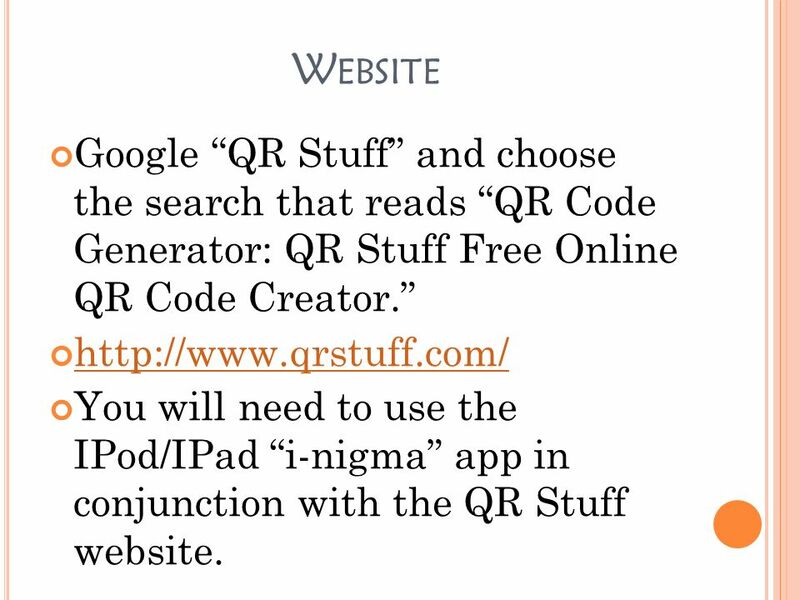 3 W EBSITE Google QR Stuff and choose the search that reads QR Code Generator: QR Stuff Free Online QR Code Creator. 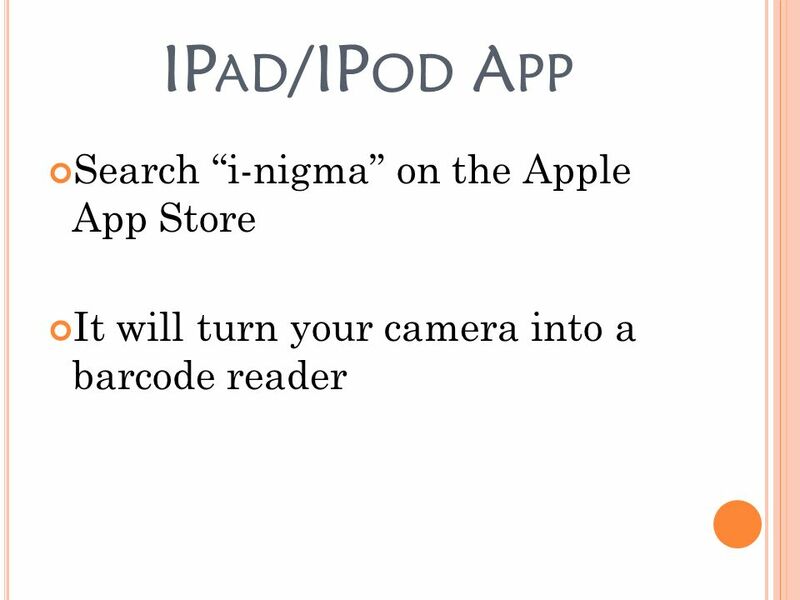 http://www.qrstuff.com/ You will need to use the IPod/IPad i-nigma app in conjunction with the QR Stuff website. 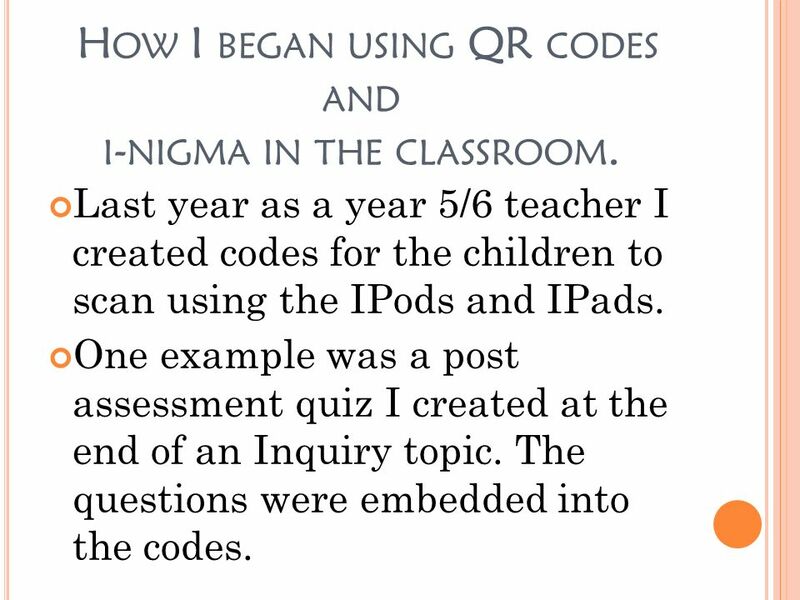 4 H OW I BEGAN USING QR CODES AND I - NIGMA IN THE CLASSROOM. Last year as a year 5/6 teacher I created codes for the children to scan using the IPods and IPads. One example was a post assessment quiz I created at the end of an Inquiry topic. The questions were embedded into the codes. 5 H OW D ID THE C HILDREN BEGIN C REATING THEIR OWN C ODES ? As part of our literacy program we were writing book reviews. Each child chose a picture story book that he/she liked from the library. 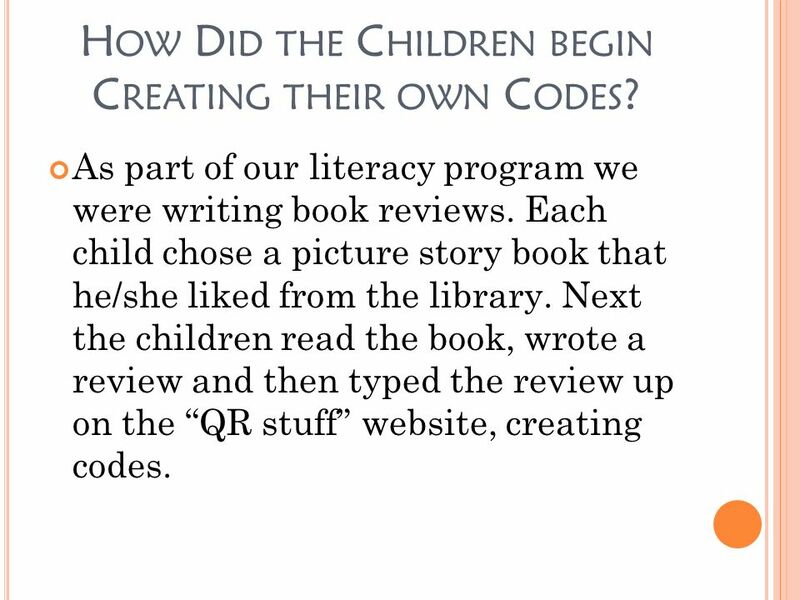 Next the children read the book, wrote a review and then typed the review up on the QR stuff website, creating codes. 6 W HAT D ID T HE C HILDREN D O W ITH T HE C ODES ? After the children had finished their codes they emailed them to themselves or to the teacher. Then they were printed and cut out, ready to be attached to the book. I realise now that the codes can be downloaded and saved in a file to be printed…this is much easier! The children then contacted their reviews onto the back of the books they had reviewed in the hope that children from other classes would use the IPods and IPads to read their reviews. Before the books went back to the library we read each others reviews using the scanner. 7 B ENEFITS F OR O THERS This year as a year 1/2 teacher I had some of the books in the classroom with the reviews on the back of the books. 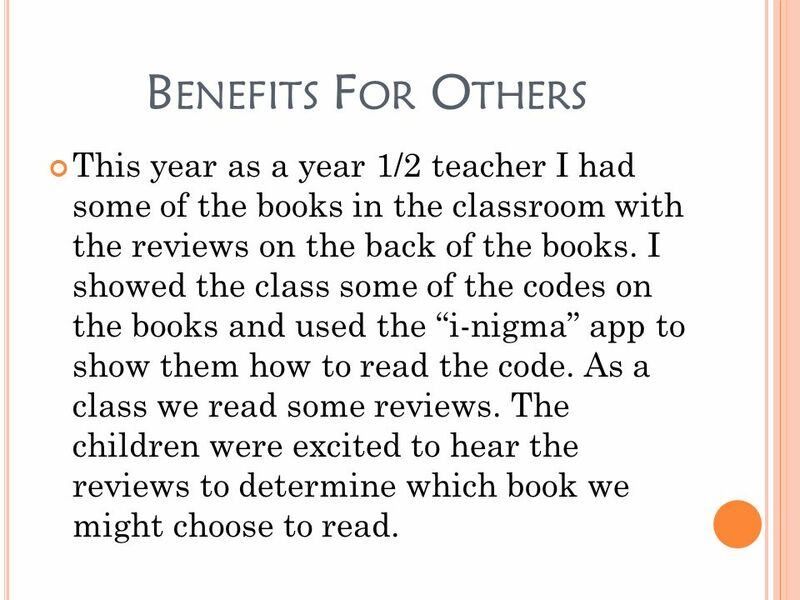 I showed the class some of the codes on the books and used the i-nigma app to show them how to read the code. As a class we read some reviews. The children were excited to hear the reviews to determine which book we might choose to read. 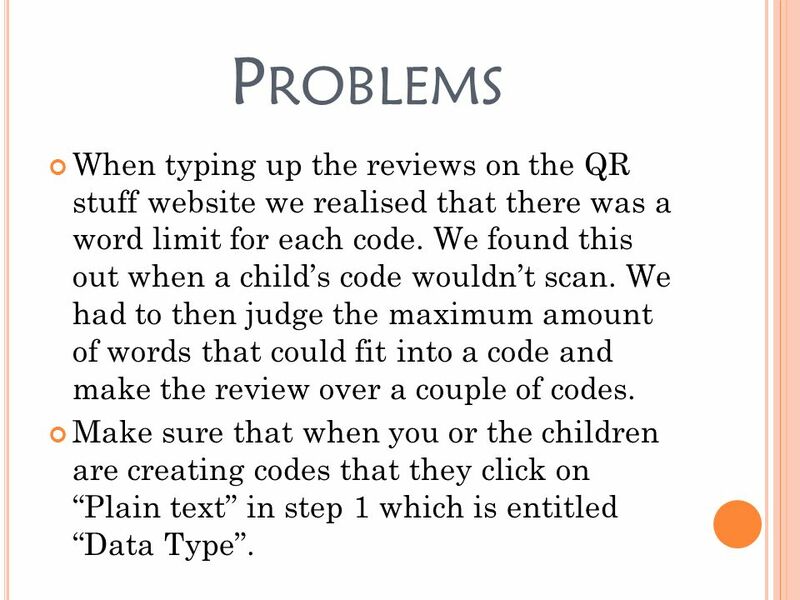 8 P ROBLEMS When typing up the reviews on the QR stuff website we realised that there was a word limit for each code. 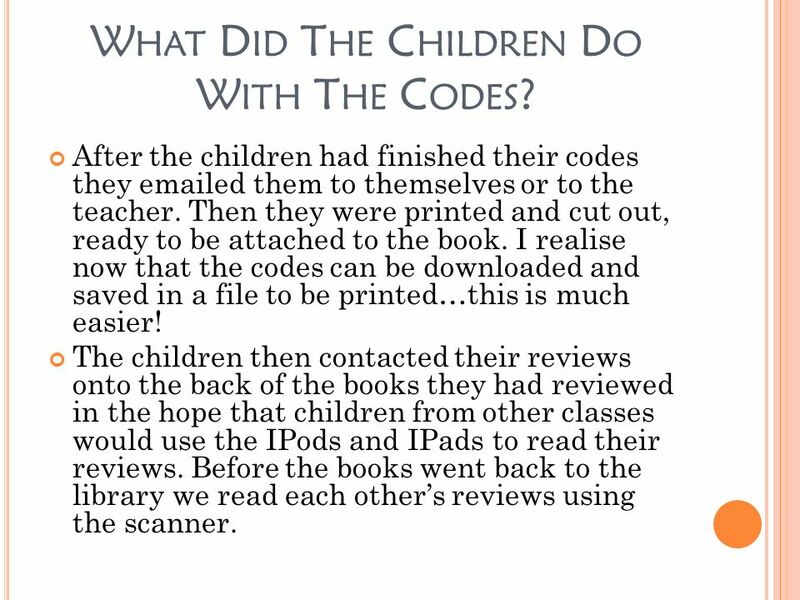 We found this out when a childs code wouldnt scan. We had to then judge the maximum amount of words that could fit into a code and make the review over a couple of codes. Make sure that when you or the children are creating codes that they click on Plain text in step 1 which is entitled Data Type. 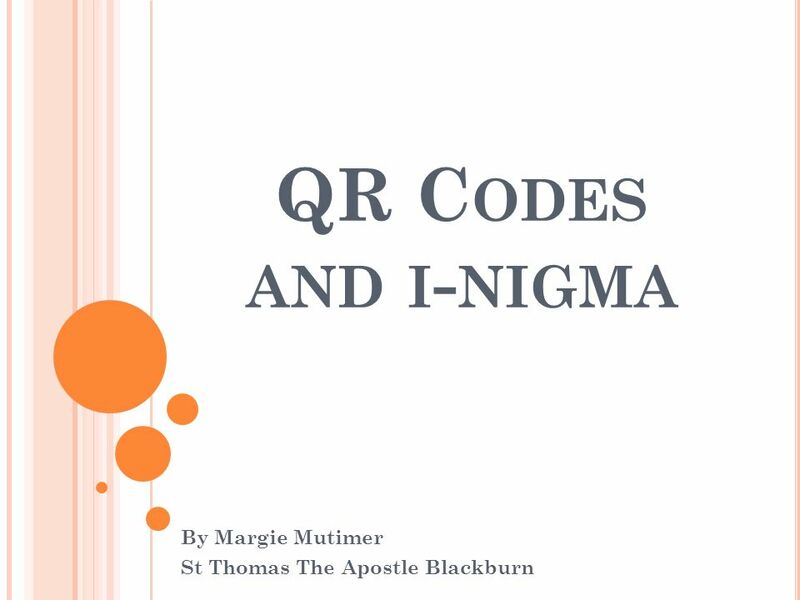 Download ppt "QR C ODES AND I - NIGMA By Margie Mutimer St Thomas The Apostle Blackburn." QR CODES. QR Codes – What Are They Quick Response Code 2-D Bar code Scanning the QR Code takes you to a website with more information. Video Website Blog. QR = Quick Response Encode: Website URL Text What do you need to scan a QR code? Device Smart Phone iPad or iTouch Webcam Elmo Camera & App i-nigma Desktop. How to use them Successfully in the Classroom. Whats a QR Code? A QR Code is a specific matrix bar code (or two-dimensional code), readable by dedicated. CBIP Mobile App How Can I get it on to my clients mobile devices? Jessica Dillard 2 nd Grade Dewar Elementary.  App and Website  Short clips  Many uses!  Demo. QR Codes EngageTech | Black and White and Scanned All Over Quick Response Codes. QR Codes What are They? How Can They Be Use in the Library Setting? Joanne Christensen 11/12. Tech Tips Reading Center Instructions Click on QR code. QR Code a fast, fun and free tool to increase your fundraising! Create. Attach. Fundraise! Scan and go. QR code allow users to access (and revisit) your. Karen Kondrick NYSRA 2012 QR CODES IN THE CLASSROOM. Spreading the News with.  What's black and white and read all over?  Five years ago the answer was a newspaper, but times have changed.  Now the. L A C U E 2013 Using QR Codes in the Classroom. CTE Conference Innovative Technology November 12, 2013 Farmington Marriott. LITERACY/MATHEMATICS CIRCLE By: Tyneka Burks. QR CODES QUICK RESPONSE CODES Download any bar code scanner app on phone or iPad.